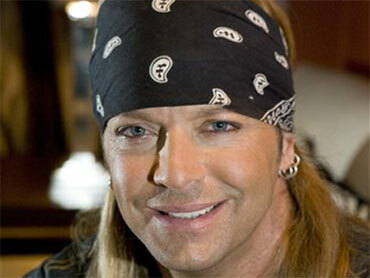 After suffering a major brain hemorrhage last week, 47-year old rock singer and reality TV star Bret Michaels is showing signs of recovery. According to his website, his doctors say he is still in critical but stable condition in the Intensive Care Unit. Michaels had a subarachnoid hemorrhage, which causes bleeding in the area between the brain and the thin tissues that cover the brain. As a result of the hemorrhage, he has also developed hyponatremia, which causes seizures. A statement posted Tuesday on the former Poison frontman's website called Tuesday's news of the additional ailment a "minor setback," but said doctors remain hopeful for a full recovery. However, according to Michaels' publicist, recovery could take weeks or even months. Michaels, a contestant on "The Celebrity Apprentice," was rushed to the hospital on Friday with a severe headache. On "The Early Show" Wednesday, CBS News Medical Correspondent Dr. Jennifer Ashton said the former host of VH1's "Rock of Love" experienced what's called a "thunderclap." Ashton explained a thunderclap is also known as a "WHOL," or worst headache of life. "It's like a light switch goes off. All of a sudden patients complain of severe, excruciating pain and they will actually come into the emergency room and say, 'This is the worst headache of my life.' That to a doctor triggers, 'We'd better (consider) bleeding in the brain,' and typically that type of bleeding comes from an artery, so high-pressure blood bursts in part of the brain and causes this severe, severe headache." Ashton said the pain is much worse than a migraine: "It's not subtle." She added the pain is usually accompanied by nausea, vomiting, a stiff neck and/or difficulty speaking or vision problems or changes in how the pupils appear. But why did this happen to Michaels? Could his hard life as a rocker contributed to his current state? Ashton said there are a plethora of causes of a brain hemorrhage. For this type of bleed, she said, diabetes is the most common one. She said people with diabetes are three-to-four times more likely to suffer bleeding in the brain. Head injuries could be another factor, but Ashton said the type of injury he sustained while performing last year -- a broken nose from a piece of a set falling on him -- isn't likely to be the cause. Instead, she said, sudden injuries or sudden blows to the head, such as injuries in a car accident, are more likely in some cases. She added cocaine and heavy alcohol use will also cause the brain to hemorrhage. When it comes to recovery, Ashton said several factors come into play, such as age, general health, and extent and location of the bleeding in the brain: "Different areas of the brain control different functions in terms of speech, memory, motor movement, and all of that is very important in developing a prognosis." As for Michaels' additional condition, hyponatremia -- low sodium in the blood -- Ashton said it's very expected after a brain hemorrhage. "We know that when there's swelling, bleeding, injury to the brain, the brain is what regulates all of our bodily functions. Multiple organ systems take their cue from how the brain is doing. When the brain is impaired, you typically will see an impairment in electrolyte levels, things like your body's regulation of sodium. And low sodium in the blood, just like high sodium levels can cause seizures." This seizure disorder isn't for life, Ashton said. It will only last until the body corrects the imbalance. She said doctors will likely give Michaels steroids to control swelling and correct his sodium levels to get the seizures under control. Going forward, Ashton said the prognosis for people with his type of hemorrhage -- even in a young person -- is poor. She said even with significant rehabilitation, most people do not regain their full capacity. "They always have some degree of deficit," she said.